It turns out that not nearly enough people make their own bone broth, instead buying it in a box or a can from the store. This is no way ever compares to the taste, nourishment, and wonder of real homemade bone broth. Never. Ever. Never. Ever. Never. Ever. Never. Ever. Never. Ever. In fact, I don’t even bother with store bought broth, as if you couldn’t tell. If I didn’t have a supply of bone broth in my fridge or freezer (that would never happen, but saying it did, or like maybe I’m traveling), I wouldn’t resort to buying broth at the store. I’d simply use filtered water since it’s probably better for me than store bought crap broth (stock) anyway. 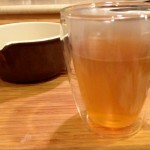 The awesome thing is that making bone broth is so easy it’s practically a joke. When I first ventured into omnivore territory after being a vegan for almost a decade, I started with enjoying pasture-raised eggs in my diet. Shortly after, I was drawn to move into other areas, and bone broth was calling my name. I never would’ve guessed that in a million years, but it did. I followed my intuition, smart woman that I am, and it’s been a fun and delicious journey ever since. I feel like a witch with a cauldron when I make it. In fact, I need a witch’s hat on when I make it. My daughter would love that. Note to self: buy witch’s hat. 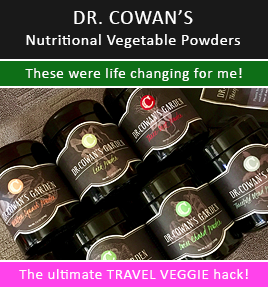 I was so enchanted by bone broth that I had to share what I was doing and learning. Share I did. To encourage everyone to make their own bone broth, I wrote an epic blog post detailing all the many ways you can make bone broth: slow cooker, sous vide, oven, and stove top. Please hop over here and read this post. Please, share it, too. And, then, make some life-changing bone broth for you, your family, and your friends. Watch life change once you do. Although my epic bone broth (how to) blog post gives you many smart tips for making your own bone broth, I didn’t go into as much detail as to the multitude of health benefits bone broth can offer your family. 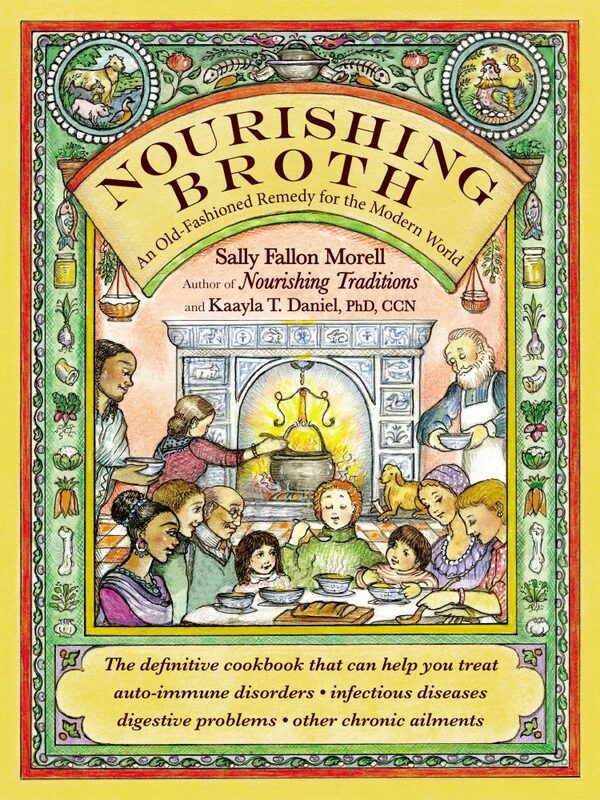 That’s where the book, Nourishing Broth: An Old-Fashioned Remedy for the Modern World, by Sallon Fallon Morell and Kaayla T. Daniel, comes in. I was lucky enough to get my hands on an advanced copy which I was all too happy to accept. I read through the thing fairly quickly, but not too fast, as it’s dense. Then, I took some ideas from the (many) recipes in Nourishing Broth: An Old-Fashioned Remedy for the Modern World, to try things in my broth like pasture-raised chicken feet to make the broth extra jelly (that means extra nutrition). Yes, chicken feet seem weird, and it was, but I quickly got over the weirdness and in place came awe and gratitude. With the help of this blog post by Nourished Kitchen, I effortlessly added chicken feet from the farmers’ market to my chicken bone broth. (Unwrap. Rinse, Put in slow cooker. Easy.). Fortunately, my chicken feet came prepped but if I had to prep them myself, the Nourished Kitchen blog details it all. I also found this source for pasture-raised chicken feet online. 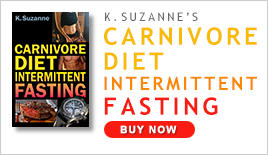 Part I: Basic Broth Science including chapters on collagen, cartilage, bone, marrow, conditional protein power, four key amino acids, and proteoglycans. 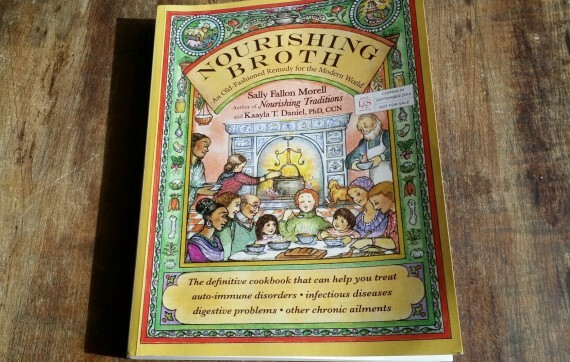 Part II: The Healing Power of Broth including chapters on research pioneers, osteoarthritis, rheumatoid arthritis, scleroderma, psoriasis, wound healing, infectious disease, digestive disease, cancer, mental health, sports and fitness, and anti-aging. Part III: Recipes including basic techniques, stock and broth recipes, soups, aspics, stews and stir-fries, sauces, meat with sauce, grains and legumes, broth for breakfast, tonics, and broth on a large scale. Easy Breakfast Rituals: The ritual of having broth as a breakfast option is really smart. I’d done it a few times in the past when I’d read about other cultures favoring savory breakfasts of soup with miso and broth, but I’m inspired to do it more now. Moms don’t need to feed their kiddos crap sugar cereal when they can give them a nice nourishing bowl of broth. I also enjoy cracking a few raw (pasture-raised) egg yolks into my hot simmering broth. It’s beyond delicious. In fact, lately, I’m having my bone broth with raw egg yolks for breakfast and then having an early lunch with my Coffee Shake Recipe. Seriously, I can tackle any monsters that come at me once I’m nourished with bone broth and buzzing with Bulletproof Coffee. I might as well wear a cape. 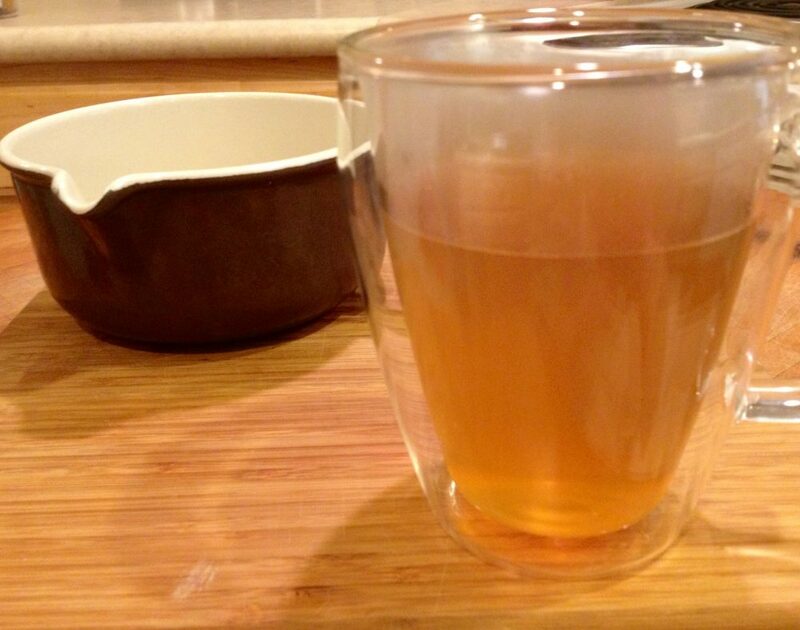 Take Bone Broth Camping or on Road Trips: We’re talking “portable stock” … boiling stock down into a thick gel which can be an amazing portable soup for camping or road trips. Warning: Everyone in the campground will be coming to your camp because the smell will be so magnetic. You better bring extra. Nourishing Broth suggests boiling it down, pouring it into a shallow tray of a dehydrator (this is my favorite dehydrator, read why here), and dehydrate the mixture until it becomes brittle. Place these brittle pieces in individual storage bags along with pieces of dried vegetables, beef jerky, and a little salt. Rehydrate with water over a campfire stove. How great of an idea is that? For Healthy Bones (but not from calcium – don’t be misled): Bone broth is showing to be good for helping build a strong skeleton, because bone broth is comprised of bioavailable minerals. Many people out there are promoting the benefits of bone broth as claiming it is a good source of calcium, but I read years ago that it is actually NOT a good source of calcium. This book I’m reviewing, Nourishing Broth, supported my prior learning that broth is not a good source of calcium; rather, broth appears to be a valuable source of many other pertinent bioavailable nutrients for a strong skeleton. Drink up. It does a body good. I highly recommend Nourishing Broth: An Old-Fashioned Remedy for the Modern World as an addition to your library. It’s going to be in some holiday stockings as gifts for my friends and family. Don’t forget… Have questions for me? I don’t have comments enabled but you can tweet them to me or send me an email.